February is a notable month in the fashion world filled with numerous runway shows and high-profile events spread throughout New York Fashion Week. 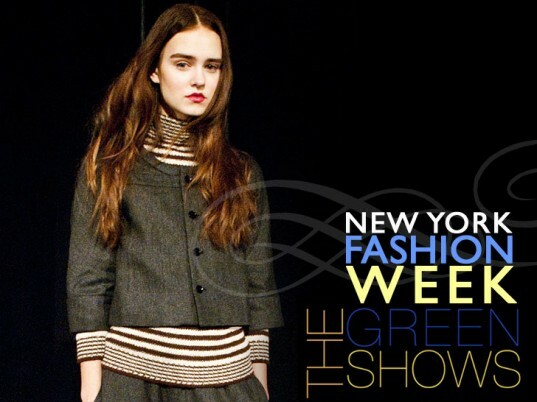 This year, Fashion Week not only showcased collections from top designers, but also included TheGreenShows, a premier showcase of sustainable design as an official part of Mercedes-Benz Fashion Week. Celebrities, editors, designers, and eco-fashionistas attended the event at Lincoln Center to see the vibrant collections of eight leading ethical designers: United Bamboo, Bamboo by United Bamboo, H. Fredriksson, Study NY, The Battalion, Luis Valenzuela, Ajna, and Artists & Revolutionaries. Each equipped with a unique aesthetic and vision, these contemporary designers also are dedicated to the implementation of ethical, sustainable and social principles in the design, sourcing, and production of their collections. From incorporating recycled and organic fabrics to producing garments locally, the designers create beautiful pieces and share their vision of sustainable and ethical design. One designer, Tara St. James, formerly of Covet, debuted her first collection of her line STUDY. Her sustainable line incorporates eco-fabrics from Moral Fibre, an initiative that supports local weavers in India while sustaining the environment. The luxurious hand-woven wool is produced without harmful chemicals and little electricity. Other collections, such as Artists & Revolutionaries, specialize in using repurposed wool and leather to create new, striking designs. TheGreenShows highlight that high-end design and ethical, sustainable, and social consciousness can beautifully co-exist. As these modern ethical designs become mainstream, more consumers and designers will start demanding sustainable designs.